Slots Magic Casino presents a state-of-the-art gaming website that is available in several languages and currencies. There is the opportunity to play without staking real money which is particularly what endears this casino to most newbies who are still cautious of committing so much. As with many competitors, they offer many slots games leveraging on software from industry leaders like Skill On Net, Net Entertainment, NextGen, WMS, Microgaming and several others. For lovers of live dealer games, Slots Magic casino also has a system that simulates the feeling of playing with a real dealer. Even with a direct focus on entertainment for patrons, the safety and security of customer information is not undermined. Slots Magic Casino ensures that all processes are legal, transparent and fair. 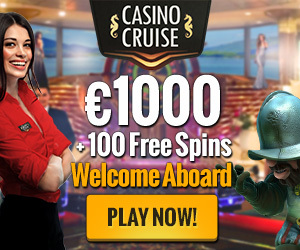 There is also a generous welcome package of about 400$ and up to 200 free spins. One major setback though is the fact that players resident in the United States and most European countries with the exception of the United Kingdom are not able to deposit funds and as such can only enjoy the free version of the games. A major measuring stick of online casinos these days is the security and fairness of its process. No client is willing to put his money in some Ponzi scheme so to improve player’s sense of security Slots Magic Casino has put in place robust credentials to boost security in a legit way. More so, with strict adherence to the gambling laws of the Malta Casino licensing body and a routine fairness test from iTechLabs whose reputation as auditors for randomness of casino games have been untainted over the years, players can only expect more from Slots Magic casino. Drilling down a bit on security, the 128 bit SSL code that the gaming outfit adopted is certain to ensure that the transactional records and personal information of players are safely out of the prying eyes of cyber-criminals. Deposits and Withdrawals can be made in several currencies including but certainly not limited to the US Dollars, Euros, Australian Dollars, British Pounds, South African Rand, Danish Krone, Russian Rubles, Norwegian Krone, Canadian Dollars and the Swedish Krona. As with the wide variety of currencies accepted so is the method of payments supported. Deposit methods like Visa, Mastercard, Neteller, Skrill, Clickandbuy, Paysafecard, EcoCard amongst others are available to players. The least amount players can stake is 20$ which is also the least amount payable on withdrawals. 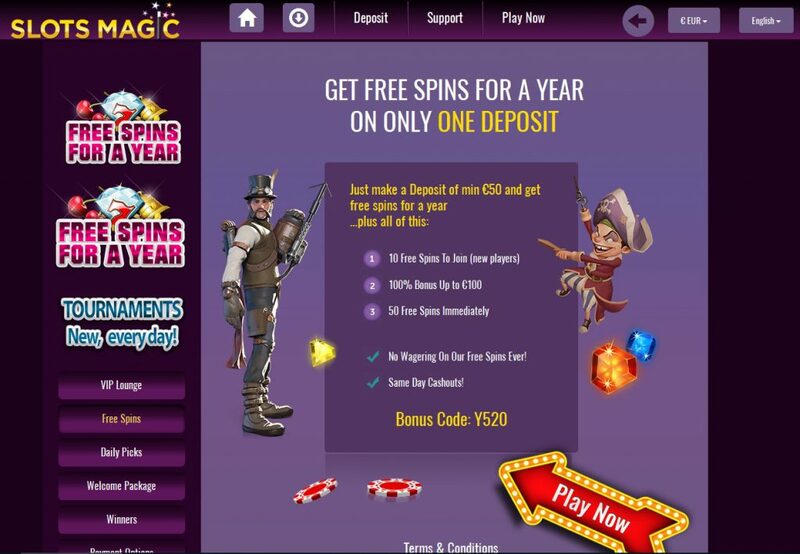 A particular issue that has been raised by some players is the fact that huge earnings like 10000$ might not be realistically payable over a 30-day period but because at Slots Magic Casino the processing of payments is quite fact and depending on the method you adopt, it might not even be up to 24 hours before your account it credited. This means, you can place two withdrawal orders every day. Slots Magic Casino proudly offers in excess of 300 slots machines which are powered by Skill On Net software. Some of the more popular slots available are Ninja Master, Zombie Bar and Millionaire Genie which is literarily a 3-reel progressive jackpot game. Also there are a couple of slots machines from WMS before the rebranding including land based games like Bruce Lee, Kiss: Shout it out Loud, Star Trek: Trouble with Tribbles and the Wizard of Oz. Apart from Skill On Net which is the biggest gaming partner to Slots Magic casino, there are also other game providers listed like NextGen, NetEnt, Microgaming, Barcrest, Amaya, Bally and Merkur Slots. This rich variety of suppliers bring to the fray awesome titles such as Mega Joker, Cosmic Fortune and Arabian Nights including other previously unknown gems which can only be discovered as players explore the several 5-reel video themes that Slots Magic offers. It is also important to note that there are only a few 3-reel classics available. While it already seems that the casino has lived up to its name and only stocked slots games, it is good to know that a full complement of roulette tables such as American Roulette, French Roulette, and European Roulette are available. Also on the list are card games like Pai Gow, Poker, Punto Banco and Blackjack. Now if you aren’t the type for virtual games, then we present you a real casino action like the Live Dealer Baccarat available at the live games section. Bonus packages at Slots Magic Casino is highly competitive with as much as 400$ and 200 free spins available when you play on any NetEnt games. The way it works is quite straightforward, as a new player, you get a 100% bonus to the 150$ limit with some 50 free spins on Starburst alone. Once you make a second deposit, you then get a 50% bonus up to the 135$ and 50 free spins on Steam Tower. The last package is when you make the third deposit, you will then get a 50% bonus on whatever amount you drop plus a whopping 100 free spins on Gonzo’s Quest. As mouthwatering as these bonuses are, it must be noted that they come with some wagering requirements which includes that all bonuses in excess of 50% of deposits pass a 30x play through for both deposit and bonuses while for bonuses lower or equal to 50% must be wagered 30 times for the bonus received alone. Please note that if a player places a withdrawal request before these requirements are met, all bonuses will be wiped, In addition, players will not be able to win more than 100$ from bonus free spins. 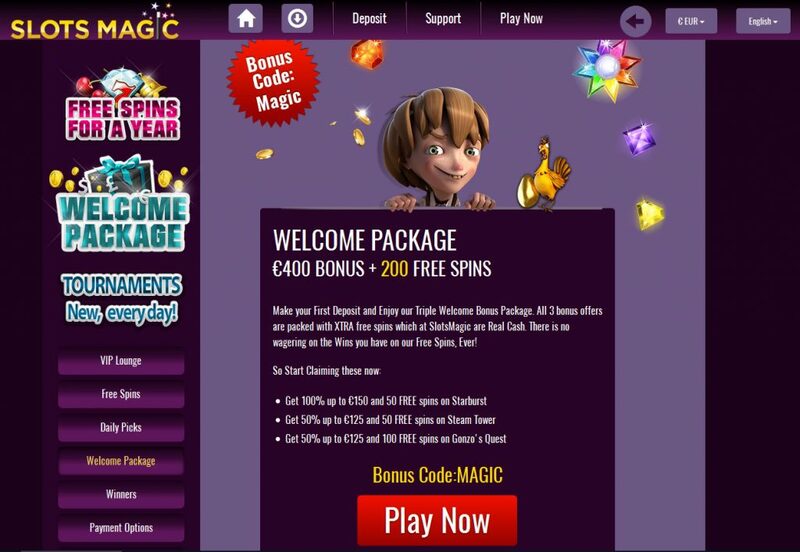 Other Slots Magic promotional bundles include Daily Picks offers which include limited edition deposit bonuses. They also have a lofty VIP section where members can benefit from extra bonuses, completion prizes and cash back. More so, players are able to access several of the Slots Magic games on their mobile devices which are what we have all come to expect from any Skill On Net powered casino. It is however available to Android and iOS devices. For any casino related issues or enquiries, there is a very efficient customer support available through telephone, Live Chat and email services.